Successfully saved The Best Vegan Chocolate Cheesecake to your Calendar. You can also save the ingredients to your Grocery List. 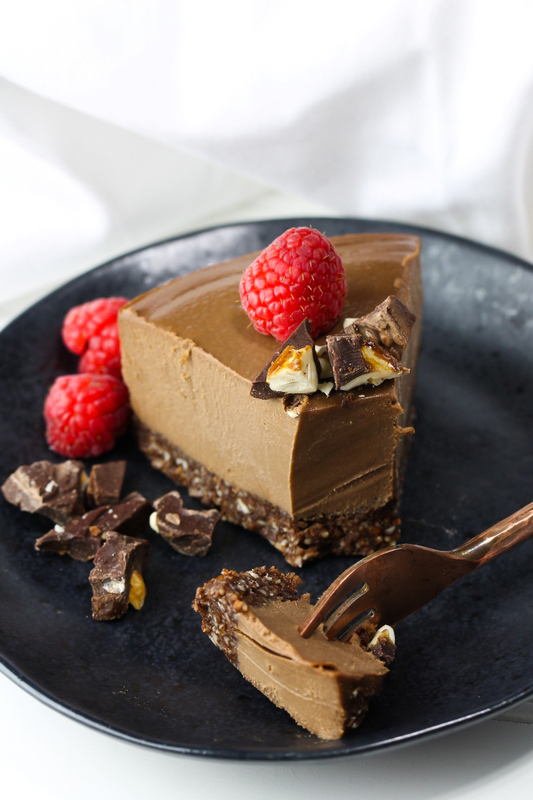 The most creamy, luscious, velvety smooth, this is the Best Vegan Chocolate Cheesecake that is dairy-free, vegan and gluten-free! This blows away everybody who tries it! Just 8 ingredients. Note: This cake has a wonderful, rich velvety chocolate texture and flavor. There is only 1 tablespoon lemon juice, a very slight tang, to really allow the chocolate flavor to be the star and not overpowered. It is not overly sweet, as I really wanted to bring out the chocolate flavor. If you taste the batter after blending and want it sweeter, add 1-2 tablespoons more of the coconut sugar, not the syrup, as you don't want to add extra liquid or it will affect the texture. Crust 1 cup raw whole almonds (150 g) 2 tablespoons raw cacao powder or cocoa powder (14 g) 1 teaspoon coconut sugar pinch fine sea salt 2 tablespoons pure maple syrup (30 mL) 1/4 teaspoon vanilla extract 1 1/2 cups raw cashews (235 g, use a scale for accurate results, soaked overnight if don't have a Vitamix) 1/4 cup + 2 tablespoons water 1 tablespoon (15g) fresh lemon juice 5 tablespoons (100g) pure maple syrup 1/2 tablespoon vanilla extract 1/4 teaspoon fine sea salt 2 tablespoons coconut sugar (20 g) 1/4 cup raw cacao powder or cocoa powder (30 g) 90 g raw cocoa butter (I used these discs b/c no chopping, so easy to use, you must use a scale for accurate results, you should have 1/4 cup + 2 tablespoons melted cocoa butter) Optional: Rawguru raw chocolate for topping. I used their crushed cashew chocolate bark . They are offering a 20% discount on their Rawmio chocolate barks (no expiration). Use code: ROCHOCVEGAN8 Note: This cake has a wonderful, rich velvety chocolate texture and flavor. There is only 1 tablespoon lemon juice, a very slight tang, to really allow the chocolate flavor to be the star and not overpowered. It is not overly sweet, as I really wanted to bring out the chocolate flavor. If you taste the batter after blending and want it sweeter, add 1-2 tablespoons more of the coconut sugar, not the syrup, as you don't want to add extra liquid or it will affect the texture.